In India nearly 90% of the welded fabrication is done by this process and even in the most advanced countries like USA, USSR, Japan, and the west European countries it accounts for nearly 60% of the metal deposited by welding machine. Though its use is slowly decreasing but it is expected to remain indispensable for repairs and short-run jobs. One of its attractive features is the lowest initial cost for a workable installation. 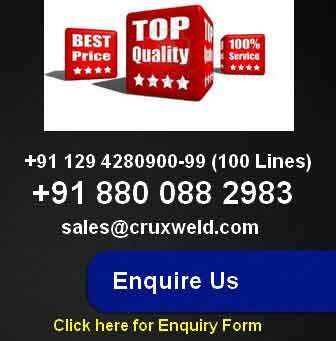 Welding power source for SMAW welding machine or arc welding machine are available which can be plugged-in, if required, in domestic single phase electric supply, hence its popularity even with small volume fabricators. The major welding equipment for SMAW is the power source which may be a welding transformer, a dc rectifier or dc motor-generator set. The selection of equipment depends upon the provision for initial investment and the range of the materials to be handled. The size and type of electrodes that are used and the penetration and welding speeds desired determine the current supply requirements. 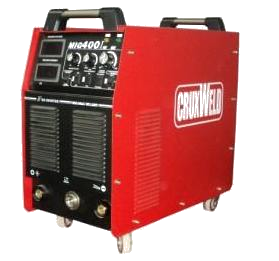 The welding power sources employed for SMAW welding machine are almost invariably of the constant current type as they serve the purpose best in maintaining the arc current undisturbed even when the welder’s hand is inadvertently disturbed through temporarily. Of the three types of welding power sources each one has its own definite advantages. The dc welding power source is very versatile in welding a variety of metals in any desired thickness. It permits portable operation and uses efficiently a large variety of coated electrodes. 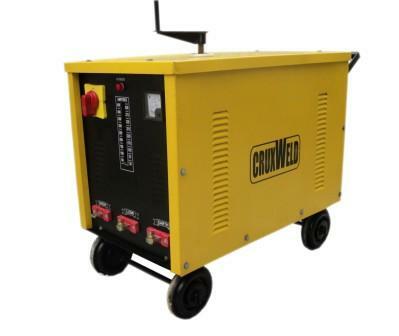 The welding transformer has the lowest initial cost as well as low operation is quite. The dc rectifier welding power source is simple in design and it combines the advantages of a welding transformer and a dc welding set. 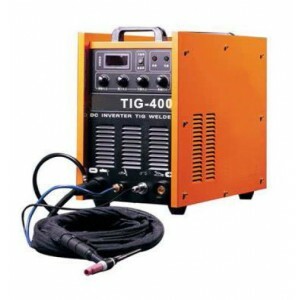 The welding equipment accessories for the welding power source include the connecting cables or leads, an electrode holder, cable connectors and the ground clamp. The cables that carry the current in welding circuit are quite flexible and are generally made of copper or aluminum wires. These wires are very find (0.2 mm diameter) and number between 800 to 2500 depending upon the current carrying capacity of the cable. Aluminum cables are much lighter and weigh only one-third of copper cables but their current carrying capacities are also lower being about 60% that of copper cables. Electrode holder: Electrode holder is generally matched to the welding cable and the cable size depends upon the current required to be carried in the welding circuit. Usually electrode holders are specified depending upon the current that they can carry; the normal range being 150 to 500A. The electrode holders of the popular design have grooves cut in the jaws which facilitate the holding of electrode at different angles for easy manipulation. The ground clamp is used to connect the other terminal of the welding circuit. It sometimes resembles the electrode holder but often it is like a C clamp is fitted tightly to the work table to avoid sparking, however most often it is rather loosely attached to facilitate easy detachment.